2. Schedules and routines don't make me weird. I've always enjoyed schedules and routines. As a child, family members lovingly teased me, saying I couldn't breathe if it wasn't on a schedule. I enjoyed making schedules (I think it made me feel "grown up") and I did function on a fairly consistent daily routine. Charlotte Mason helped me understand that routines are not only not weird, but they're also important for children. This is especially so if you have children on the autism or bipolar spectrums. 3. I like the arts. I don't possess any artistic skills in the way of painting, drawing, or composing music. I wasn't raised with art in my world. I started paying attention when my son picked up a paintbrush and began painting at the age of 18. I paid attention when, that same year, he sat down to a keyboard and played Für Elise with no lessons. I was astounded by his natural talent. And still I no attention to the arts. Then I read Charlotte Mason's thoughts on art, composers, and teaching these things. Our first artist study began in December 2009. I was hooked. I developed an appreciation for the arts that has only grown since then. Now I make sure my kids have art supplies and resources. We have regular artist studies. In fact, I've learned quite a few ways to add art to our homeschool. 4. I enjoy teaching my children. As a child, I pictured myself being a school teacher. In fact, I've spent my entire adult life teaching, in one way or another. Whether I was teaching kids at the local school, I parenting classes at the domestic violence shelther, I've always been teaching someone. But my kids were in school. Then we unschooled only because I really didn't know what I was doing. 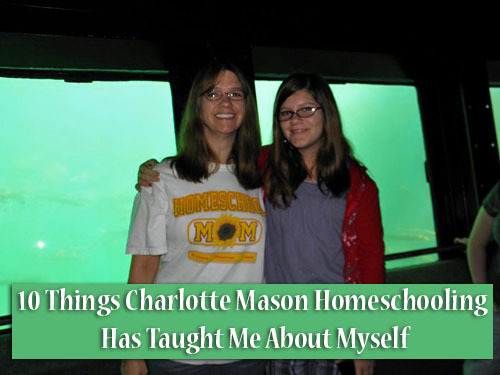 It wasn't until I began teaching using the Charlotte Mason method that I grew to enjoy teaching my own children. Prior to that, I felt that teaching them was so difficult. Textbooks and worksheets and struggles, OH MY! I didn't enjoy it and neither did they. We really love the Charlotte Mason method. 5. I can teach a child to read. When I began homeschooling, my kids were in middle and high school. I had no idea how to teach a child from the start. I didn't think I could teach a child to read. So when Alexis was 5, I sent her to private school. I brought her home at the end of 2nd or 3rd grade. Lorelai is the only child who has homeschooled from Kindergarten. And guess what. She reads! 6. I enjoy the process as much as the end product. It's not enough to want my children to know their ABCs and 1-2-3s. It's not all about the value of X. Homeschooling is about enjoying the process. It's about developing a love of learning. Yes. I want them to learn. But I want more than that. I want them to want to learn. I want them to enjoy learning. I want them to seek knowledge because they want to know something. My goal in homeschooling is to produce adults who love learning. 7. I must be careful in teaching my children what honest is. I understand truth. I understand what truth is. I didn't realize that I must instill the habit of "Accuracy of Statement" in my children. Miss Mason taught me that. In other words, allowing exaggeration is also allowing a child to lose his sense of truth. 8. I must create habits in my children. Humans are creatures of habit. 99% of what we do is done without a thought. Habit. Training children in good habits while young is vitally important. "Habit is Ten Natures" is an important lesson I've learned. 9. I must provide an atmosphere fit for learning. "Education is an Atmosphere", Charlotte tells us. This doesn't mean a room full of miniature furnishings and brightly colored wall displays. It means a calm, peaceful, loving home filled with things of beauty (art, music, materials) from which children can learn. Atmosphere creates a place where they learn from life itself. 10. I must be more disciplined. "Education is a discipline" applies to the children, yes. They must learn to do their work within an allotted time, and learn to do it well. This applies to parents, too. Scheduling our days and weeks is easy. Sticking to that schedule is the trying part. But we will not teach our children the value of doing our work in the time allotted if we don't do it ourselves. What has homeschooling taught you about yourself? Hop over to iHomeschool Network and see what the other moms have learned from their children. We love the Charlotte Mason method too, for many of the same reasons! We unschooled for the first 10 years. At that point, I found Charlotte Mason and wished I'd known about it from the start. Every child and family is different, isn't it? Great lessons. I am always amazed at how much I learn about myself (and other topics) as we homeschool.